This past Saturday marked the beginning of the 20th Anniversary of Power Rangers with the premiere of Megaforce. Overall I enjoyed the first episode “Mega Mission” along with the multiple references to the original Mighty Morphin Power Rangers. I don’t think it was ever mentioned where this series takes place, if their town has a name at all, but in this area the kids enjoy going to Ernie’s Brain Freeze, a juice bar apparently part of a franchise it would seem from the original Ernie. We learn right off the bat that the Rangers leader Gosei was a pupil of Zordons and placed on Earth with his robot assistant Tensou (who looks like that robot from the Short Circuit films crossed with Wall-E.) Their underground headquarters is lined with “Statues” of past Ranger teams and like Power Rangers Samurai before it, there’s also a “Go, Go Power Rangers” styled theme song and there were several quotes taken directly from the first episode. The sets were awesome and the school halls specifically remind me of Angel Grove High, probably on Purpose. The actors are on par with any other Rangers series as far as their talent goes although Troy is a little stiff, even for a Red Ranger. Hoping his opens up and gets better as the series goes on. The other four however, all seemed to be really good actors and played their roles without feeling cheesy like some Ranger actors tend to do. I was a bit surprised at how easy it was to tell the American footage from the original Japanese footage though as I had more trouble doing that during the Samurai seasons. I’m looking forward to how the season progresses and really am excited for the eventual Legend War that is sure to be a big focal piece as well. I wasn’t impressed with the villains, though I know they’ll probably change up later. They just didn’t seem imposing or evil enough for the guys the Rangers have to fight in their 20th season. Not to mention they just sort of…show up. 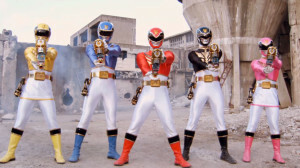 This combined with the Rangers having to use their Power Cards to continually summon their weapons were the only things that bugged me really about the premiere. I mean, come on, if I was a Monster and you whipped out your Morpher to get a card and stuff, I’d just smack it out of your hand. Oh No! No more blasters! Obviously, I’m taking that a bit too seriously, and its meant to draw kids in with the toys, but still. COME ON! With one episode down, I expect a lot of great things from Megaforce and hope they don’t let us down as fans! ← Entire Boy Meets World cast offered roles on sequel. First, information that has recently broken: Megaforce takes place in Harwood County according to RangerCrew. Second, as implied by “Brainfreeze”, this Ernie’s is an ice cream parlor owned by a guy named Ernie (obviously not the same Ernie from MMPR-Zeo). Unless there was a reformatting of the original juice bar and fitness center, it’s not the same Ernie’s. Obviously its not the same Ernie! lol. With them serving what looked like smoothies, it just seemed like it had to be a franchise or something! But OBVIOUSLY not the same Ernie’s.